Where the two Carolinas bump one into another, the sun smiles on Little River, a historic fishing village that – despite all today's modern advances and attractions – feels a whole lot like a pleasant trip back in time. Situated on the banks of the Intracoastal Waterway beneath the gnarled arms of giant oaks, you'll discover an unhurried and uncommon side of the Grand Strand. 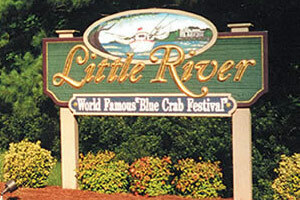 In its early history, Little River hosted the famous and the infamous. As an out-of-the-way, protected harbor, pirates, smugglers, blockade-runners, and bootleggers are said to have found refuge here. George Washington also dined here while traveling the Kings Highway on his Southern Tour in 1791. From cheerful shops, large and small, an unexpected array of merchandise spills forth. Some things fancy, some things kitschy, some things unlike anything you'll find anywhere else. In every case, shopping here is certain to turn up surprises during your North Myrtle Beach vacation. Beyond simple shopping excursions, you can also schedule a deep sea fishing excursion (they are famous! ), take a cruise down the Intracoastal Waterway or hang around and chat with well-bronzed fishermen while they haul in the day's catch. Restaurants abound. Marinas abound. And, fresh seafood abounds. Acclaimed golf courses are also part and parcel of this magical Southern landscape. Water is the undisputed King and everyone is subject to its reign. There's even a local winery, La Belle Amie Vineyard! In Little River it is still possible to discover marvelous pockets of solitude. 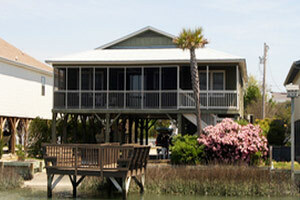 Yet all the amenities of a larger metropolitan area are a short drive from this peaceful place.